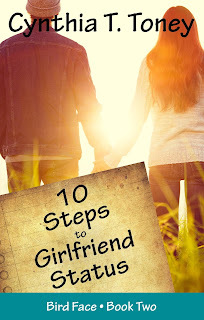 Book Review: "10 Steps to Girlfriend Status"
In 10 Steps to Girlfriend Status, Cynthia Toney continues the first-person narrative of Wendy Robichaud that she began in 8 Notes to aNobody. Like the first book in the Bird Face Series, the sequel is issue-driven fiction for teens. This time around, Wendy is struggling to cope with a blended family after her mom remarries. Wendy’s best friend Alice is now her sister and she has gained a six-year old brother. The whole family needs to adjust. In addition, her former next-door neighbor and adopted grandmother, Mrs. V., is suffering from Alzheimer’s. And, to make life more emotionally complex, Wendy is starting to date. Thrown into the fictional mix is a mystery Wendy is trying to solve about a great uncle that disappeared many years earlier after falling in love with a girl his family didn’t approve of. 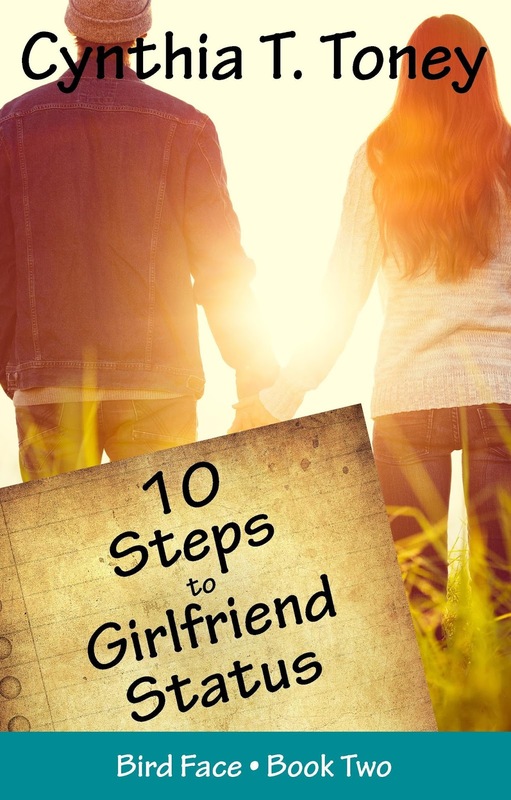 10 Steps to Girlfriend Status is an enjoyable read. Those who read the first two books in the Bird Face series will be eager for Toney to pen more stories about Wendy and her life. 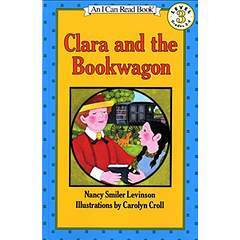 “Clara and the Bookwagon” is a reader that I recently discovered at my local library. It’s an older book, but one which I enjoyed so much I wanted to recommend it. Clara is a farm girl living in Maryland around 1900. She does not go to school because there are no schools for farm children. Instead, she spends her days working hard on the farm. She has a vivid imagination and loves stories and has a secret wish to learn how to read. Some time later, Miss Mary comes to visit her farm with her traveling book wagon. She tries to lend Clara a book, but the young girl remembers what her father said and turns it down. The librarian offers to go talk to her father for her and even offers to teach Clara to read. This wonderful tale is based on the true story of Mary Lemist Titcomb, the head of the Hagerstown, Maryland public library, who started book stations in general stores, churches, and homes. In 1905, she began the first horse-drawn bookmobile. 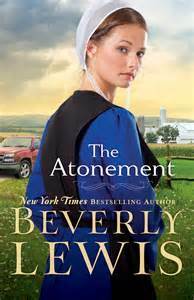 New York Times bestselling author Beverly Lewis provides a story of regret and self-punishment in “The Atonement,” her recent work of Amish fiction. Lucy Flaud pours her heart into a life of service, caring for both Amish and Englischers in an effort to make up for the sin of her past. She is not banned from the community, but she does not feel like a full member of it, either. Her heart is not at peace and she carries both deep resentment and painful grief. When her father begins to attend a grief support group at a local community church, he meets Dale Wyeth, an Englischer interested in living a simpler life. Their friendship causes complications with Lucy and forces her to revisit a chapter of her life she’d much rather bury with busyness. Lucy’s efforts to redeem herself through her own willpower will ring true to anyone who has attempted to make up for their own wrongdoing. Lewis has created a complex heroine and a story that makes for pleasant and inspirational leisure reading. Is Screen-Time Causing Your Child's Meltdowns? 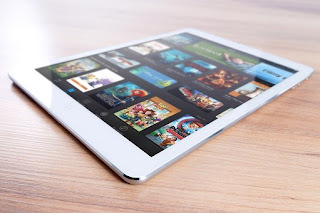 With my three children, two teenage boys and a five-year-old girl, I’ve always tried to practice a path of moderation when it comes to screen-time. When my boys were younger, I was able to enforce a two hour time limit fairly well. They could choose to use their time for television or video games, but they were reasonably good about adhering to the rule with occasional please for time to finish whatever level they might be playing. But something happened about five years ago – we got an iPad. Then, because it was so fun and useful, we bought a second one. Son #2 began to use it to read and watch videos about his favorite hobbies which prompted son #1 to claim the same right. We also downloaded some wonderful educational apps to use for school. It was hard to legislate the line between entertainment and education. In addition, when their friends came over, they would all play video games together. Needless to say, the time limits for them were relaxed. I still encourage reading and non-screen activities, but they do spend a great deal of their time on tech devices. Meanwhile, my young daughter also developed a love of the iPad, enjoying videos and games. I limited her time to a while in the morning and a while at night. I would use the morning session to say my prayers and read the paper while I ate breakfast. At night, I would work on the computer. I knew she spent too much time on tech, but I figured it was the price to pay for my sanity. As an introvert, I need quiet time. On the other hand, my daughter is a high-energy extrovert. There are no other children in the house her age for her to play with, so I keep her busy most of the day, providing opportunities for time with others as well as for physical activity and educational projects. She does play by herself for part of each day, but I use that time to homeschool my older two children and take care of the house. My daughter also has some behavioral issues which I’ve always attributed to trauma from being adopted and from her never-ending supply of energy (both of which are no doubt part of the issue). Children on the autism spectrum, with attachment disorders, learning disabilities, mental health issues, and ADHD are all at greater risk of experiencing ESS. It doesn’t necessarily cause the problem, but it can make it worse. Dunckley provides ten years’ worth of case-studies and research to support her findings. While Dunckley does encourage a four-week fast from screen-time, she makes a distinction between television (which is less harmful) and interactive screen time which includes time spent on computers and all hand-held devices. She still allows moderate television viewing even during the fast. What have I done with all this information? First, I had my sons read the parts of the book that I felt applied to them. I hoped that they might voluntarily reduce their own screen-time. Unfortunately, they aren’t buying that tech usage is part of their learning and social difficulties. At their age, I have chosen to not make it a battleground. I will continue to encourage non-screen activities as much as possible. My daughter is a different story. I took away the iPad completely and am allowing her to only watch television or a DVD for about an hour in the morning (I really do need that alone time to get my day off to a good start). Giving up the time at night has been a sacrifice, although being summer it is less of one than it will be in the winter when she can’t go outside to play. She did cry a bit about the loss of her beloved videos, but she quickly accepted the change. I did explain that it was not a punishment; that the screen-time was hurting her brain and that I was doing this to help her. It has been about two weeks. The results were almost instantaneous. Has she become the sweetest, most well-behaved girl overnight? No, but bedtime battles have all but disappeared, she’s falling asleep more quickly, and she hasn’t had to be sent to her room for having an attitude or being out of control at all. While she has still had her moments, being around her has been a much more pleasant experience. Clearly, the sacrifice is worth it. If you have a child with behavioral issues, I encourage you to read Reset Your Child’s Brain or visit the accompanying website at ResetYourChildsBrain.com. Reducing interactive screen-time just may be part of the solution. Sr. Elizabeth Wagner is one of the founders of Transfiguration Hermitage, a semi-eremitical community in Maine devoted to prayer and solitude. In “Seasons in My Garden,” she meditates on “human desire and human struggle, with human weakness and vulnerability” as well as on “the experience of God’s presence.” Though her individual lifestyle is not one most of us are called to experience, her reflections speak to universal “emotions, needs, and desires.” She invites us to God wherever our lives may take us. The garden in the title refers not only to the physical garden she tends throughout the year, but also her interior spiritual garden which also needs cultivation and which changes along with the physical seasons. All of us, whether we realize it or not, are connected with nature. Those of us who live in areas with four distinct seasons can certainly relate to Sr. Elizabeth’s ebb and flow as she sojourns through the year. 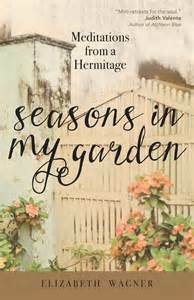 “Seasons in My Garden” is a meditative book and while reading it in a traditional fashion provides a cohesive experience, the chapters can also be read independently as mini-retreats in the midst of a busy day. This work provides a gift of peace and reflection and invites us to contemplate life in harmony with the natural world around us. Wendy Robichaud is almost fourteen years old. Her father has left her family for a new one and her mother is recovering from having carpal tunnel syndrome on both hands. Wendy is also jealous of her best friend who is “changing and leaving her behind” and she has a large nose which has earned her the nickname “Bird Face.” When she starts receiving anonymous encouraging notes from “A FREND,” she has no idea what to make of it. 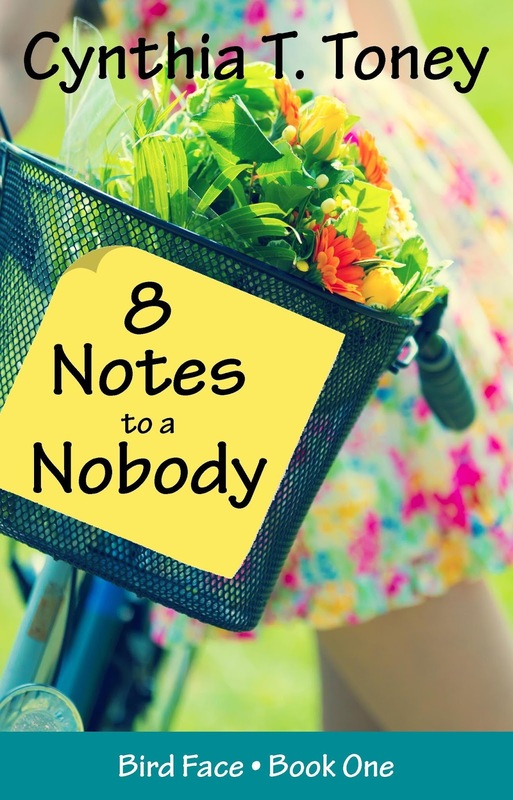 Writing in the first person, Cynthia T. Toney has captured the voice of early adolescent angst in “8 Notes to a Nobody.” This issue-driven Catholic fiction deals with anorexia, suicide, and alcoholism. These are all serious, weighty topics, but are handled in an age-appropriate manner and without the story becoming depressing. At its core, this is a story of hope about discovering a sense of self and finding one’s place in the world. 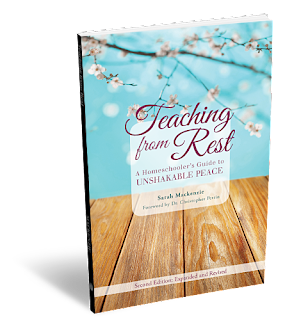 I had heard several other homeschooling moms praise Teaching from Rest: A Homeschooler’s Guide to Unshakable Peace (Classical Academic Press )by Sarah Mackenzie. When I recently had the opportunity to read it myself, I was not disappointed. This is a homeschool classic in the making. Mackenzie emphasizes relationship before the academic component of homeschooling, both our relationship with God and our relationship with our children. While she has high standards for academics, she ­­­doesn’t feel that they should be achieved at the cost of things that are more important. “People rank infinitely higher on the list.” She emphasizes that we need to trust God. “I can’t teach from rest unless I trust Him with my kids’ education. . . .unshakable peace is not tied to my success at all. It’s tied to faithfulness.” In order to be faithful, we need to make prayer a priority and offer up all our daily efforts to God. She offers practical suggestions for destressing your homeschool. Those who adhere to a school-at-home philosophy or who use an all-encompassing boxed curriculum will probably not find her suggestions worthwhile while those at the other end of the homeschooling spectrum might find her ideas a bit too rigid, but eclectic and relaxed homeschoolers of all stripes will find wisdom and encouragement in these pages. One might not want to incorporate all of her methods, but they might challenge you to make small changes in how you approach homeschooling. Mackenzie also tackles care for homeschooling moms. We moms in the tranches need to feed our own souls as well and she offers suggestions on how to do that even amidst the busyness of family life. Mackenzie hasn’t reached the teen or young adult years yet which provide a whole new dimension to homeschooling life. It’s easier to wax poetic about not caring about a child failing when you don’t have a child approaching adulthood who is actually struggling. It’s hard to trust in God when you truly feel that you have failed, that despite your best efforts and all your prayers, the outcome hasn’t turned out anything like you hoped. Homeschooling offers no guarantees, but those of us who walk the hard road do well to trust in God, even when it feels He is nowhere to be found. Mackenzie looks to St. Monica for inspiration. “If Monica had judged the success or failure of her mothering based on her son’s [the future St. Augustine] behavior at age twenty, she would have considered herself a failure.” As a mother, I imagine she probably did. We need to remember that God is still there even when we feel abandoned and that the project isn’t done until He says it is done. God always has the last word. Teaching from Rest is a short book, less than 100 pages, but it is an important contribution to homeschooling literature, especially for Catholic moms. Additional companion materials are available at Classical Academic Press. My daughter wanted to paint today so I joined her and did some painting of my own. It's been a while since I've indulged in some art therapy (my usual creative outlets these days are writing and quilting) and I enjoyed it a great deal. Unclaimed: The Memoirs of Jane E, Friendless Orphan is a futuristic retelling of the first half of the classic Jane Eyre penned by Charlotte Bronte. 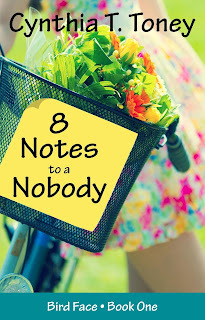 We meet Jane at age 10, when she is living as a foster child with the Van Deers family. An unclaimed embryo, she never knew her parents. Due to their mutual dislike, she is sent to live at the Naomi Froundation, a work/study program in Delhi. There she meets Aidaan, a Catholic who becomes her one friend, and learns how to weave secret messages in cloth. As Jane seeks to find her place in the world, she learns some important lessons about herself and about faith. While this story definitely pays homage to the original, one need not have read the classic to appreciate it. 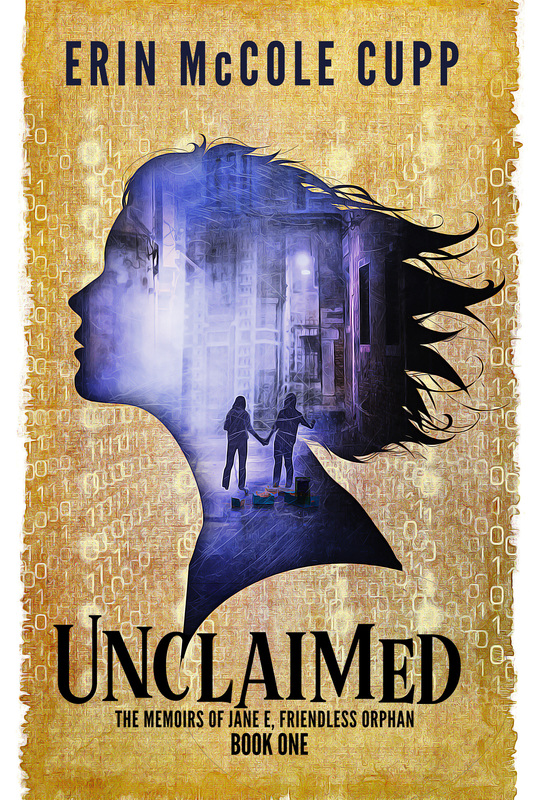 By the same token, knowing the underlying story does not take away from the enjoyment of reading Unclaimed. Cupp has penned an intriguing, thought-provoking tale well-worth spending time with.